GreenSchools is the new web tool provided by the Province of Treviso with the purpose of sharing information about energy and sustainability in our schools. It has been realized to support the transformation path towards a Green Schools and to connect people in order to allow experience, ideas and best practices sharing. The new web portal is a window on the all available projects and activities carried on by the Province of Treviso schools. School's communities, students and teachers are engaged in an active competition to make their school more sustainable, through many activities whose details are shown across the following GreenSchools pages. GreenSchools is a powerful tool for information, communication and knowledge sharing about the entire energetic topics in schools. It aims to educate and empower the future of modern society on the use of natural resources, creating the basis for a modern and efficient management. The instrument are different and address a broad range of stakeholders. The mission is to make every student the focus of a renovation global process thanks to modern technologies and social instruments. 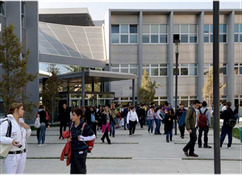 GreenSchools is a web portal where is possible to have a complete vision about the all activities and information in the Province of Treviso schools and in the other international schools. Furthermore thanks to GreenSchools it is possible to know the schools' assets (structural and common spaces management) and the Sustainable Projects and Activities for the Competition. GreenSchools is the Gateway on Green World, it's possible to know all the activities realized by other (international) schools (in the world) and to connect our students with foreign ones thanks to the social networks.